Emma Halliday and Michelle Collins are researchers who joined us at the spring event in Manchester to talk about how they've been working with young people in West End, Morecambe Big Local area. Emma Halliday and Michelle Collins work for the National Institute for Health Research, School for Public Health Research at Lancaster University and as part of their research they have been involved with West End, Morecambe Big Local where they have recruited and trained young people in the area to work with them as community researchers. Emma and Michelle’s research is about developing a tool which can help to collect information on local neighbourhoods so that you can understand what a place is like. 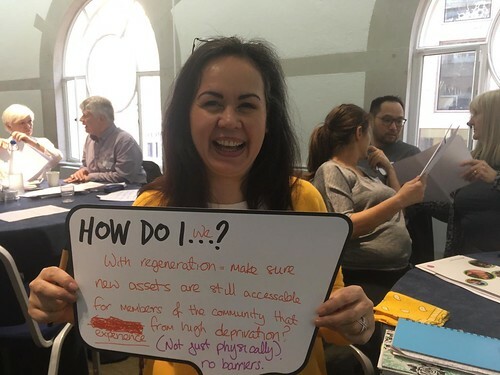 The aim of getting community researchers was to involve people who live in neighbourhoods in testing out the tool, and therefore help Emma and Michelle to get the tool right. Emma and Michelle went to West End, Morecambe to meet members of the partnership and explain the project. This included what the aims of the project are, how it would work, and what the safeguards would be. Input from the partnership helped Emma and Michelle to work out how best to trial their community research tool, and how it would work for the young people. Emma and Michelle needed to make sure that the work would fit with their university’s guidelines for ethical working, and ensured they were properly recognising and valuing the voluntary work that the young people would be doing. It was quite a challenge for Emma and Michelle to recruit young people and also to enable people to take part in all the sessions, but they tried a variety of ways. They found that it worked well to go through the area’s locally trusted organisation, as well as through existing community groups who were already working with young people locally. They also put up flyers and encouraged word of mouth to raise awareness. There were some practical issues to overcome, such as finding a time of day that would work for everyone. For those aged between 16 and 18, they were required to be in education or training during the daytimes, but older young people (up to the age of 24) might not be available in the evenings. The venue that they used turned out to be an unexpected bonus, as there was a cookery class running at the same time, and the two groups got together at the end of each session to enjoy the freshly cooked food! Four young people got involved, all over 18, some in work and some unemployed, some involved with Big Local and others not. They attended a series of four workshops led by Emma and Michelle, where they learnt about the neighbourhood record tool, tried it out and gave their views about it. “it’s been interesting going through the process of developing the record, especially seeing where it was and where it is now”. “nice to be part of it – to be able to include your own input and opinions”. Emma and Michelle have found their input tremendously valuable. They saw how the map-based tool worked well as a starting point. The young people could easily recognise their area and its key features, but they then went on to add to the map a whole other layer of information, showing the location of many things such as where the youth club is, or where well used bus stops are. Emma and Michelle note that it wasn’t just the wealth of local knowledge that the young people brought in, but the way that the young people helped them to realise the importance of the nuances of that information. For example, it isn’t enough just to know that there are a certain number of benches in particular places. The community researchers pointed out that one of these benches is next to a recycling bin and that sometimes people hanging out there tend to use it as a drum kit and therefore cause a noise nuisance for some of the residents who live nearby. They also got ideas about how to make the tool more user-friendly, such as changing the layout to make it more appealing. And they found out that using the word ‘audit’ in the name of the tool was off-putting; however, they haven’t yet found the ideal solution – please let them know if you can solve this one for them! Each of the young people was given a Post Office voucher that can be used in lots of outlets nationally, in recognition of the time and input that they had given, and the researchers hope that the skills they’ve picked up through taking part in the project will be useful as part of their on-going education, training and work. Emma, Michelle and the community researchers hope that the partnership will find that the work shows how rich and interesting their area is, and that the information could be used as part of their profile for their Big Local plan. Working together on this has started to build a relationship between West End, Morecambe Big Local and their nearby university. Both parties hope to continue to build on this relationship in the future. The young people have one more session to go with Emma and Michelle, where the main topic of discussion will be what could happen next. Emma and Michelle see that local residents have lots of valuable skills that make them very good community researchers, and that doing this kind of work opens up opportunities to develop new skills too. They would like to find a way of offering formal accreditation for community researchers, and to explore opportunities to do more work with community researchers in future. The two are also aware that residents in Big Local areas are already doing a huge amount of research about their areas. So whilst they might not be called this, or think of themselves in this way, they are already community researchers!